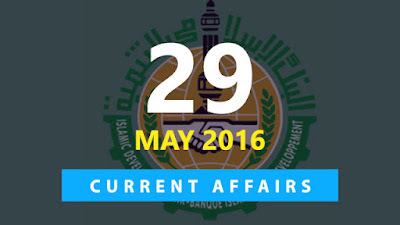 Hi Aspirants, here is the Current Affairs Multiple Choice Quiz for 29 May 2016 useful for all upcoming exams. All the Best. 1. Indian Air Force (IAF) on 28 May 2016 successfully test-fired a land-attack version of the supersonic cruise missile, BrahMos at the Pokaran field firing range in Jaisalmer of which state? 2. Pakke Tiger Reserve in which state recently won the ‘India Biodiversity Award 2016’? 3. Who was on 27 May 2016 sworn-in as the Chief Minister of West Bengal for second successive five-year term? 4. Critic and litterateur R G Jadhav who died on 27 May 2016 was famous in which language? 5. Which Indian was recently bestowed with 2016 Harvard Business School Alumni Achievement Award? 6. ____ on 28 May 2016 became first Union Territory to sign 24x7 Power for All document? 7. Who recently sworn in as the new Chief Minister of Kerala? 8. Who was on 26 May 2016 appointed as the head coach of Indian Cricket team for Zimbabwe tour? 9. Saudi Arabia’s Islamic Development Bank (IDB) has decided to open its first branch in India at? 10. Bioengineer Frances Arnold from which country recently becomes the first woman to win Millennium Technology Prize?